By cupcakeSerenity on April 28th, 2011 . Filed under: Contests . If you’ve been down the baked goods aisle lately, you may have noticed that Hostess Cupcakes has added Strawberry to their flavor lineup. 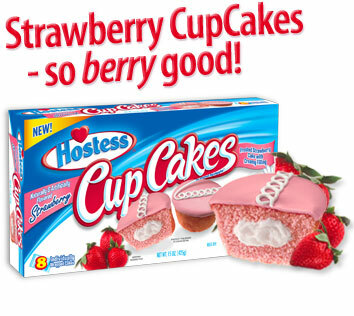 These pink delights are part of Hostess’ Jackpot promotion. Cupcake lovers are given a chance to win $10,000, or more than 300 daily prizes (one of which is a one year supply of Hostess Cupcakes). If you want to play, look for a specially marked multipack, and then register the game code at www.hostesscakes.com. While you’re there, you can also vote for your favorite cupcake flavor.